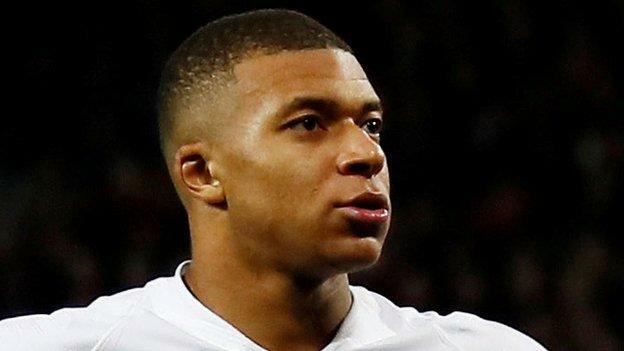 Paris St-Germain forward Kylian Mbappe called for an end to the “scare stories” about injuries to star players Neymar and Edinson Cavani after he led his side to a 2-0 win a Old Trafford. Neymar and Cavani were absent as PSG scored two away goals in the Champions League last-16 first leg – Mbappe adding to Presnel Kimpembe’s opener. “We need to stop with the scare stories. People need to stop being afraid,” the 20-year-old said. Brazil forward Neymar has been ruled out until at least April with a broken metatarsal, with French reporter Julien Laurens telling BBC Radio 5 live that there are fears that his season may be over altogether. Uruguay striker Cavani injured his thigh last weekend but could be fit for the second leg in Paris on 6 March. But Mbappe is the club’s top scorer, with his goal against United his 23rd of the season in all competitions. His 14th Champions League goal means he has already drawn level with France great Zinedine Zidane. “Of course Neymar is hugely important and Cavani is fundamental to us, but football is played on the pitch and we showed that today,” he said.